The ocean is a strange and mysterious place. According to the National Ocean Service, mankind has explored less than 5% of the ocean – and we've uncovered some intensely strange-looking undersea animals with some weird and mysterious mouths living there. There are plenty of gross things about animals - like the gross ways animals eat. But when we think of ocean creatures, we think of dolphins playing just off the shore or adorably pudgy seals with whiskers so cute it makes a freezing trip to Arctic seem worth it. What we don't picture - and try our best to forget - are all of the terrifying, crazy undersea creatures with demon mouths straight from the depths of hell. These weird animal mouths sometimes serve a purpose, and other times they're just freaky. From the dragon fish with its dagger-like teeth, to the goblin shark that literally unhinges its jaw like some sort of horror film monster, these underwater mouths are the craziest known to man. 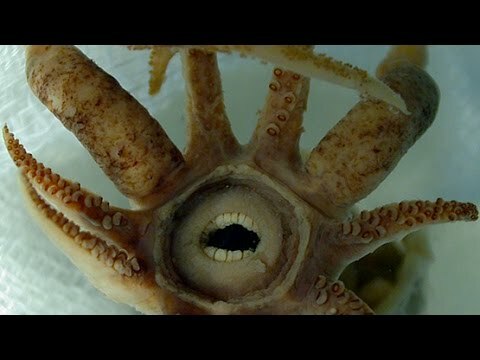 If there's any animal that would make a dentist proud, it’s Promachoteuthis sulcus. You may know it by its unofficial (but easier-to-say) name, the gob-faced squid. This strange-looking ocean critter appears to have a mouth full of human chompers, but it turns out they're not teeth at all. Possibly the only thing more weird and unsettling than an undersea creature having human teeth is an undersea creature having a mouth full human teeth that are actually a bunch of lips. That's right, what looks like teeth are actually circular, folded lips that surround the squid's beak to protect it while the creature isn't eating. The gob-faced squid is known only from a single, small specimen that was pulled from the water in the south Atlantic Ocean at a depth of 2,000 meters (3,500 ft). It's basically a toothy reminder of how little researchers know about what lies beneath. If you thought great white sharks were the most vicious and terrifying sharks of all, think again. Goblin sharks grow up to about 12 feet long, and have so many teeth they can't fit all of them inside of their mouths. The top and bottom teeth are attached by ligaments that allow the beast to unhinge and extend its mouth to grab pray. It's almost like a bear trap, if a bear trap could reach out and grab you. Thankfully, you won't encounter these guys during your average swim. They typically dwell on the ocean floor along continental shelves. These little critters are not the chill, totally radical sea turtles from Finding Nemo. They may look cute on the outside, but the second a leatherback turtle opens its mouth, you're going to want to run. A leatherback turtle's mouth - or jagged hole of doom - is filled with hundreds of giant spikes and small leathery tongue. The teeth, or "papillae," line the inside of the turtle's mouth, esophagus, and gut. Leatherback turtles are the third largest living reptile in the world, and the reason they've got so many backwards-facing teeth is to help them eat slippery jellyfish without their prey escaping. This chubby turtle's terrifying mouth can handle any kind of jelly including giant lion's manes and smaller swarms. No, this isn't Sarlacc, Jabba the Hutt's favorite pet in Star Wars. This is a sea lamprey, a jawless, boneless fish found in estuaries and rivers across the US and Europe. The sea lamprey is a parasite that spends most of its life in the ocean, only returning to rivers and lakes to breed. It uses its mouth to suction onto pray and its rows and rows of teeth to clamp down. 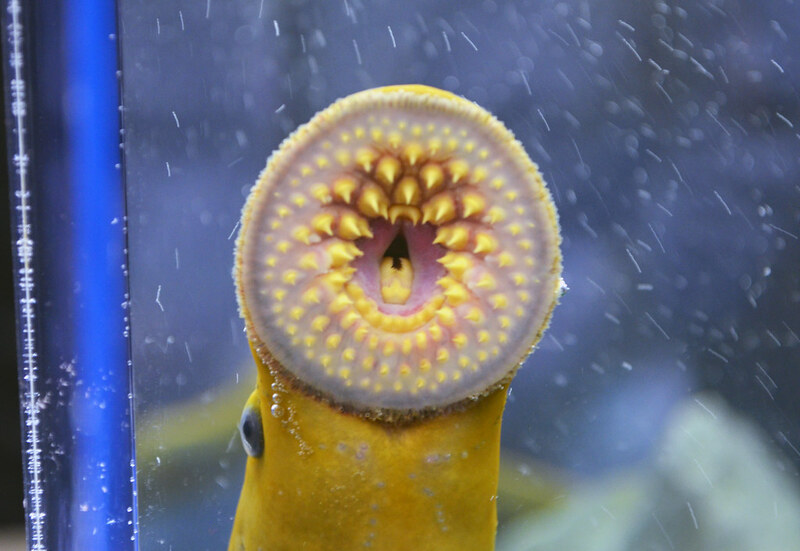 Once clamped on, the sea lamprey uses its tongue to rasp through fish scales and skin and feed on the blood and fluids of their pray. They're so deadly that only one in seven fish attacked will survive.